This month’s edition of AoT BCS will feature simulations and the chemical history of the Universe! 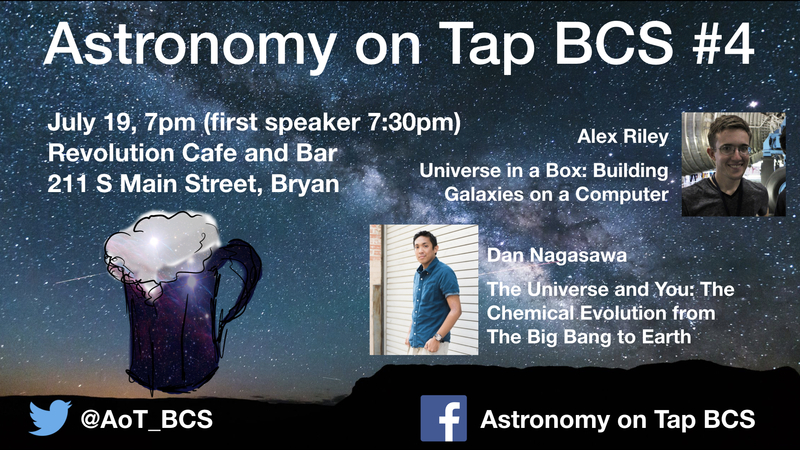 Alex Riley will tell us about “Universe in a Box: Building Galaxies on a Computer” and Dan Nagasawa will talk about “The Universe and You: The Chemical Evolution from The Big Bang to Earth!” There will also be trivia and, of course, beer! For more information: RSVP here, and follow us on Facebook & Twitter! When? : Thursday, July 19. Trivia starts at 7pm, first speaker at 7:30pm.